A company should be far more than simply buildings, equipment and the services it provides. A company is really the commitment of its people to serve its clients. 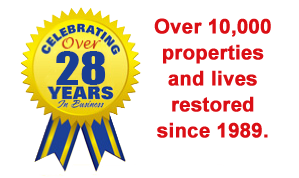 Our commitment, from the very top all the way through our organization, is to provide impeccable service to our clients regardless whether the project is a minor mold remediation or a major fire restoration. To achieve this commitment we provide our staff with extensive training, education and certification as well as stay current with the latest technology and processes. And we demand the very best from ourselves and every one of our people. ICC is focused on restoring damage with as little reconstruction as possible, so property is returned to normal faster. But if reconstruction or other services are required, we can be your single source of contact to take the project from start to finish! ICC gets life back to normal faster! We use a variety of special equipment and procedures designed to restore damaged properties in one-third to one-half the time, keeping restoration costs down and preventing secondary damage such as mold. We’re able to save items that others discard without even trying to restore, reducing completion time even more. ICC operates in a completely transparent manner, providing comprehensive documentation and on-going communication in near-real time. Not only does this demonstrate what happened and what steps are being taken to restore the loss, it provides a permanent record that the property was restored to the proper Standard of Care. ICC offers the widest range of restoration and reconstruction services in the Twin Cities area and Western Wisconsin, from emergency board-up to mitigation to full reconstruction services. This includes water and sewer damage, fire damage, storm restoration, mold and microbial remediation, biohazard clean up, a full in-house contents restoration system and other services.